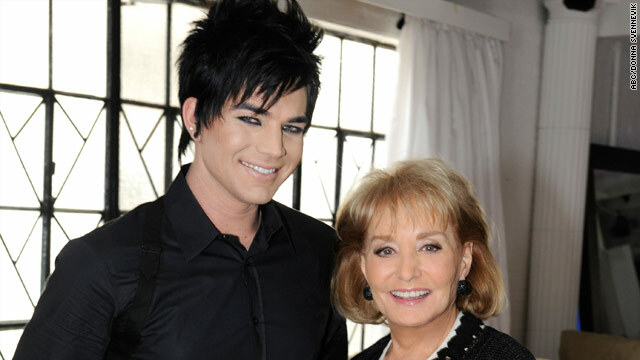 Adam Lambert made Barbara Walters' list of "The 10 Most Fascinating People" of 2009. Every year, Barbara Walters sits down with "The 10 Most Fascinating People"
(CNN) -- Technically, Barbara Walters' "10 Most Fascinating People of 2009" numbered more than that. The list included singers Lady GaGa and Adam Lambert, first lady Michelle Obama, former Alaska Gov. Sarah Palin, radio and television host Glenn Beck, writer-director Tyler Perry, reality star Kate Gosselin, quarterback Brett Favre and South Carolina's first lady Jenny Sanford, whose husband publicly confessed to having an affair. Rounding out the list were Michael Jackson's three children, Prince Michael Jr., Prince Michael II (known as Blanket), and Paris Michael Katherine, who were counted as one unit for the purpose of making it 10. The special is a perennial one for Walters, who refuses to disclose who her top pick is until the show airs (the 2009 honor went to Michelle Obama). In an interview with Fox talk show host Bill O'Reilly, Walters explained the thought process behind this year's selections. "The word is fascinating," Walters said. "The word is not newsmaker; the word is not most important; the word is fascinating. Who are the people who, for one reason or another, fascinate us?" Walters talked controversy with Lambert, the "American Idol" runner-up whose sexually charged performance on the "American Music Awards" landed him in hot water. Walters asked the openly gay singer if he would have changed anything about that night. "I would do it exactly the same way," Lambert said. "I am who I am, and I think freedom of expression should be alive and well, and unfortunately, it's not." With Lady GaGa, Walters delved into the woman behind the "performance artist" and probed the sexuality question, getting the Grammy-nominated singer to once again admit that she likes women. Lady GaGa also shared a story about how she once dealt with a room full of unruly spectators while performing in a club in New York City. "I walked into the room, and before I even opened my mouth they were yelling and chatting and drinking and slamming their glasses. And I, I kept [saying], 'Excuse me, hello,' and nobody would stop," the singer said. "So, um, something just came over me and I, I took my clothes off." The person named the "most fascinating," first lady Michelle Obama, talked with Walters about life in the White House, her workout and her guilty pleasures. "It's usually food-based and really bad TV," Obama said, laughing.